Retreat: To get another piece of candy. 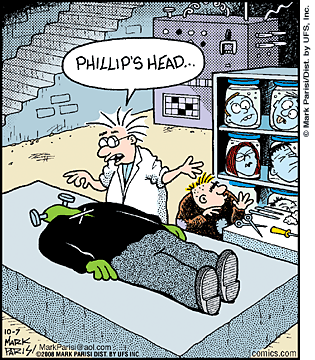 I wanted to share with you some Halloween related humor…. When is is bad luck to meet a black cat? When you are a mouse. What did the ghost buy for his Haunted House? Home Moaner’s Insurance. Where does Dracula water-ski? On Lake Erie. 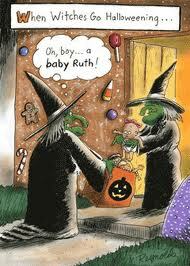 Why don’t witches ever have babies? Warlocks have hollow-weenies. I’m sure you’ve all seen the Christmas decorations in the store windows already; the small displays or the blown out red and green stores. Its slightly annoying as its not even Thanksgiving, much less Halloween yet. But I thought I would jump on the bandwagon and give you some Christmas ideas ahead of time so you can prepare for your parties which I am sure most of you will attend. And I was raised being told that you can’t show up to a party empty handed. Bringing a gift or a plant can always work, but if you are trying to impress family or friends, something creative and clever will do the trick. It also helps if it is edible. 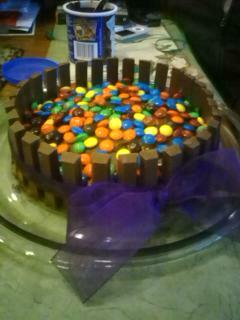 I love to make crafty edible things out of chocolate. Last Easter I made a chocolate cake and transformed it into an Easter basket by simply outlining it with Kit-Kat bars and m&ms tying it together with a purple ribbon. As I was stumbling around online I found an easy new recipe at tastykitchen.com. They have so many recipes that are fun and easy. I found something that will work for Christmas as well that is clever and easy: Strawberry Christmas Trees! 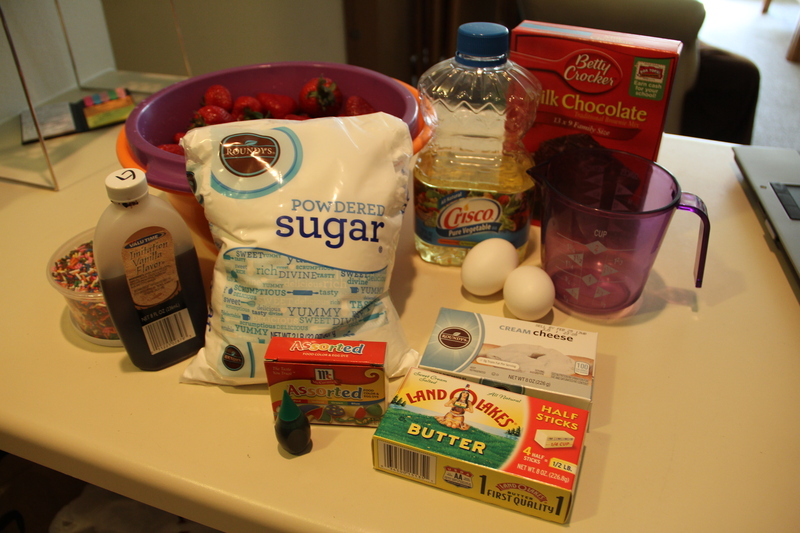 Mix together your brownie batter. Separate it equally into greased cupcake pans or a brownie edges pan. Bake for shortened time because you will be baking individual brownies. Watch your brownies to make sure they don’t burn. Test them with a tooth pick to make sure they are fully cooked. While the brownies are baking you can prepare the rest of your supplies. Cut off the top of your strawberries. Set aside the berries until you need them. Combine all of the frosting ingredients into a large bowl. Make sure the butter and the cream cheese are soft for easier mixing. 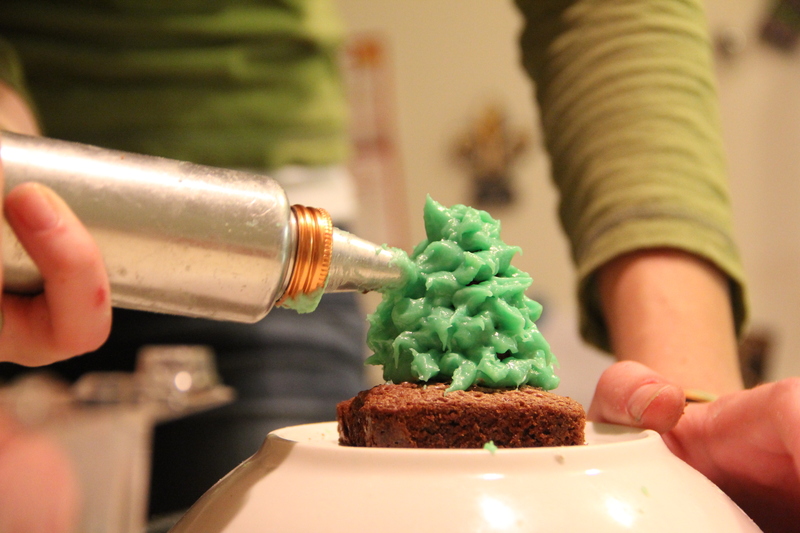 Add green food coloring and mix until you get your desired shade of green. 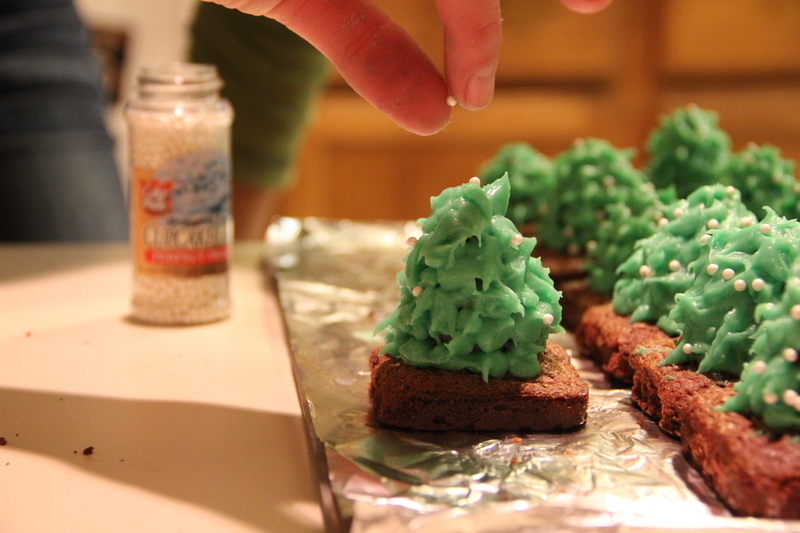 You can sprinkle powdered sugar over the brownie to look like snow. 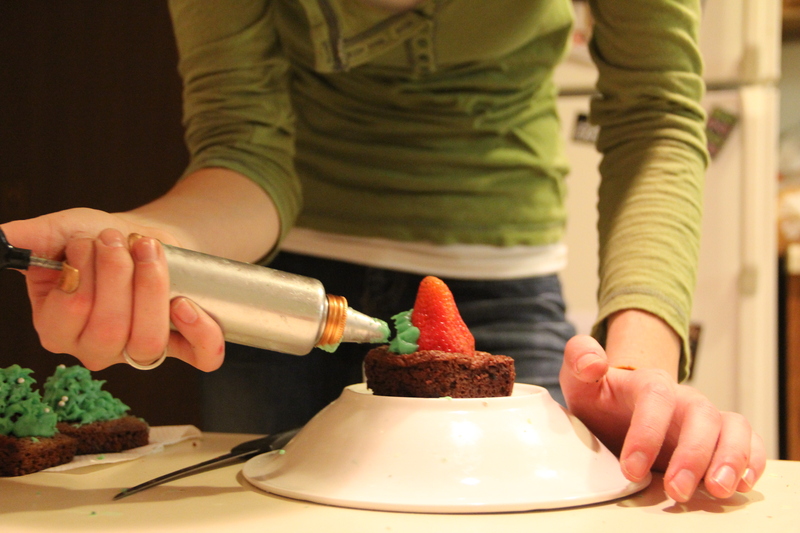 Place a dab of frosting in the center to hold your strawberry on top. Switch to a star tip and start creating your pine needles. away to form the point of the needles. – Cover the whole strawberry. Bring out the sprinkles and stars to decorate your tree. Each one can be unique because no two trees are alike. Now that you know what to make, what you need, and how to make it you can make your own forest to impress friends and relatives. You could also take it one step further. If your relatives have kids make it a holiday project. It will show them that you are not only clever in the kitchen but you can entertain kids with fun projects as well. This can win you brownie points as well….pun intended. I hope you enjoy your edible holiday crafting fun! 1) Jack-o-lanterns were carved to invite the spirits of loved ones home. 2) Jack-o-lanterns were also carved to defend the house from evil spirits who might try to escape their world during that night. 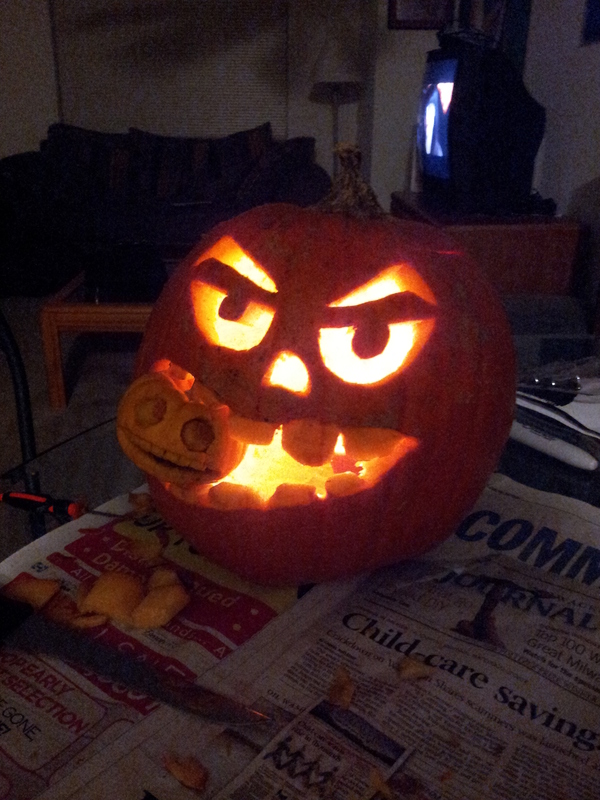 It is said that the a face is traditionally carved into a Jack-o-lantern because it represents ‘Stingy Jack’. It is said that Stingy Jack was a man who had made a deal with the Devil that if he was in service to him that he wouldn’t be condemned to hell. When Jack died he was barred from Heaven and turned to the Devil who granted his wish of avoiding death but cursed him to walk the earth with immortality and the fire of hell to guide his way…which is why the carved pumpkin is called a ‘Jack-o-lantern’. On Friday October 19th, I was able to take part in my first Gallery Show. I have had work in student shows before, but this was different; it was bigger. The show put on by my Open Box Project class was in conjunction with a show presented by other professional artists; ‘Beyond Vision: A Tactile Exhibition‘. I went through the same process for this show as the professionals did: finding something out about myself, making a piece of work that explored that idea, figuring out a way to present my piece and then sharing my thoughts with other viewers during the opening. It was like getting a backstage look at how a gallery show happens. I am very happy with my work; a tactile triptych observing the life and death of a dandelion; entitled ‘Dandelion Wishes‘. During the opening night of the show I was able to see how different people interacted with my work and hear their initial thoughts about the piece. I had many people come to view and feel my piece and I had some amazing discussions with some great people and artists about my piece and the other works on display. Also, having a show that is designed specifically for the visually impaired is a challenge for visual artists, like myself, to covey our thoughts and ideas in a way that does not use our visual sense. My piece was true to my photographic interests, but I added the element of touch by etching the images in my photographs onto the glass in front. It was so wonderful to be able to speak to the visually impaired who came to support the artists in the show and see how they interpreted the work we created individually, as a class, and as a show overall. It was such a great opening night, and I would love to take part in something like this again. There is a new show in the Northwestern Mutual Art Gallery at Cardinal Stritch. This show contains many works of aren’t from various artists. 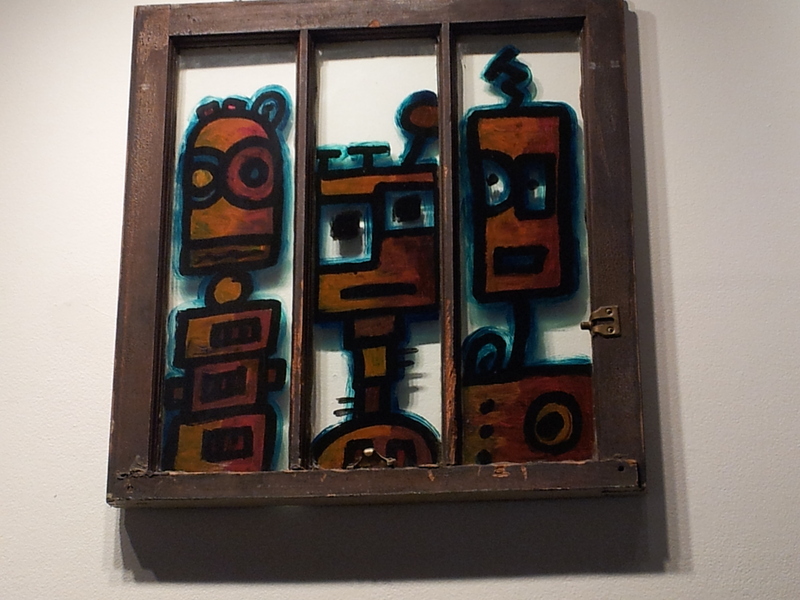 There are insect made out of metal, photographs printed on canvas and embellished with a gel paint and old windows and doors with various robots painted on them (pictured above). The overall feel of the show was simply fun. The insects were coppery and some were placed on the wall, others in little habitats that were created out of wood to look natural. Each bug had a face of a student or staff worker that the artist knew. The photographs on the canvas were of differing scenes; my favorite was one of a small child that was overlaid with a landscape scene. It was a juxtaposition of human and nature, but it worked together beautifully with the composition and then the added embellishments. My favorite work was the painted robots by Naomi Kaufman-Wickens (naimileedesigns.com). Her old windows depict cartoonized robots painted on glass. The one pictured above reminds me of my sisters and I. We are each a bit quirky but still individual and unique. The robots are so playful and colorful. 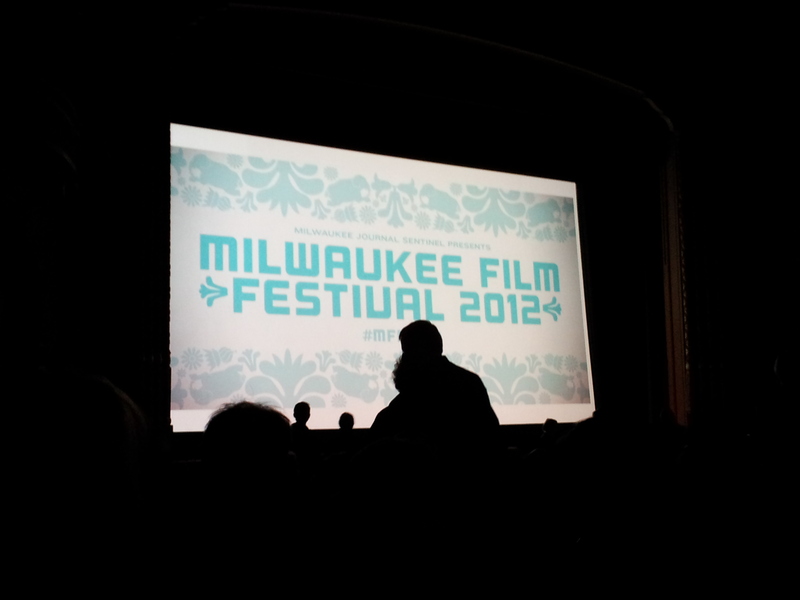 Last night I attended my first film at the Milwaukee Film Festival at the Oriental Theater. I had never gone before but I definitely plan to go again. I went to see a show entitled ‘The Milwaukee Show’. It was a set of ten short films shown back-to-back with short intermissions when the creators of the film – directors, producers, actors – all came up on the stage and talked for a few minuets about their films. The films themselves were each a different cultural aspect of Milwaukee. The first ‘film’ we saw wasn’t actually a part of the show, but it was still a great short movie. It was a documentary about the 24 hour bike ride held downtown. I had no idea there even was such a thing! It was so cool and insightful, it was a great little intro piece to The Milwaukee Show. The ten shows in the line up were 1. Gears, 2. Sing (for trouble), 3. Walking Piece, 4. So I Could Fly Away, 5. THe Evilest of Sorcerers, 6. Cat Waco, 7. She Leaves the City, 8. Reflection, 9. Studies in Space, and 10. The Vampire Formerly Known as Dracula. My least favorite shows were the ones that had no plot, were super short and made no sense whatsoever. Unfortunately, that was about half of the films. The other films in the lineup were great! I have two favorites from The Milwaukee Show. They happened to be the very last two films shown. Numbers 9 and 10. ‘Studies in Space’ was a very artistic piece. A beautiful woman sang in an opera-esque voice through the whole film while ballet dancers preformed to the song in slow motion with flowing dresses and paint and beads and feathers. The colors were so vivid paired with the exquisite details and locations combined with the extreme talents of the dancers in slow-motion. It was a really extraordinarily beautiful film. My other favorite was the last film of the night: ‘The Vampire Formerly Known as Dracula’. It was a comedy with a plot and it had modern references as well as references to the original story of Dracula. Another interesting fact about this piece was that it was actually written by a young man in the ninth grade! It was such a great funny script, I enjoyed watching it so much. On September 15, Holy Hill held their 38th annual art fair. I had never been to Holy Hill before but I was told that it was really beautiful, so I was excited to go. And being a artsy creative person an art fair sounded like a perfect way to end the afternoon. I thought I’d go look at some art, get inspired and then be able to create some of my own. Turns out that there were hundreds of people there. I didn’t think that so many people would opt to spend their Saturday just looking at art (it turns out that there were no crafting tents). I was really excited to see so many people there and to be able to view all of the art. People were showcasing the expected paintings, drawings and photography. But some art I didn’t expect to see was glass work, metal work and wood work. I saw cheese and cracker plates made out of melted wine bottles and a giant freestanding dragonfly made out of metal. There was also life-sized sculptures of bears made out of whole trunks of trees. (We ended up leaving with one who was roasting a marshmallow over a wooden fire. His name is Jimmy). My favorite tent besides the one with the bears was a metal works tent. They weren’t making anything on site, but they were selling their products. The interesting thing is that they didn’t use raw materials for their pieces, they used old silverware. They made bracelets and rings out of bent and twisted forks. They had business card holders and kokopelli people. And they also had a religious aspect to their work as well being at Holy Hill. The made crosses out o f butter knives and forks and then they made angels out of spoons (pictured below). 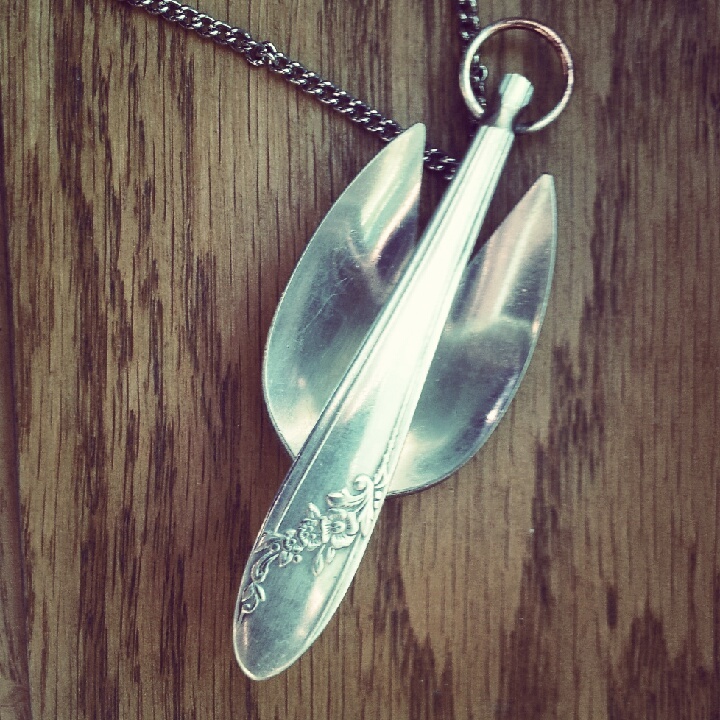 I ended up buying one of the spoon angels, it was just clever and quirky and still made sense. After we were finished browsing the tents, my aunt and I decided to trek up the hill and climb to the top of one of the towers. It was approximately 178 steps to the top and being on a hill we ended up being pretty high. The view was spectacular from the top. We could see for miles in each direction. And being at the top of the Basilica in Hubertus I could see the building in Milwaukee faintly in the distance. That is about 40 miles of uninterrupted sight. It was beautiful.